National Review Photoshops Grover Norquist out of Marco Rubio photo. McKay Coppins noticed that the new cover of National Review, fronting a “Marco Rubio is selling us out” story, removed the recognizable face of Grover Norquist. NR Editor-in-Chief Rich Lowry quickly responded that “our extensive market research shows that partially obscured bearded anti-tax activists do very poorly on our covers,” and that there was a disclaimer in the magazine anyway. 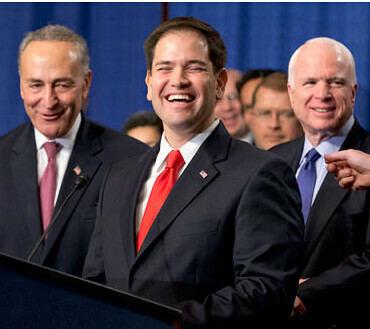 On one level, I think the Photoshop artist blew it, because the cropped but unretouched photo features the indelible image of Rubio laughing while some dude points at him. What Lowry could have said is that leaving Norquist in the photo would have made the image confusing. Real, but confusing. Norquist looks unhappy, but he’s clearly overjoyed—as my friend Sean Higgins pointed out last week, Norquist has been an avowed supporter of “amnesty” and immigration reform for a generation. Reformers keep cashing that check, bringing out Norquist to argue that the dam has broken, and that even conservatives mocked on The Daily Show now back legalization. They’d really do better recruiting some of the state-based Republicans who’ve melted on immigration; hey, I have a story about that today.